Henry Holt and Co. (BYR), 9781627796996, 256pp. The year was 1981. Just two months into his presidency, Ronald Reagan was shot after leaving a speaking engagement in Washington, D. C. The quick action of the Secret Service and medical professionals saved the president's life. Mere days after his near-death experience, Reagan's personal strength propelled him back into his presidential duties. Adapted from Bill O'Reilly's historical thriller Killing Reagan, with characteristically gripping storytelling, this story explores the events of the day Reagan was shot. 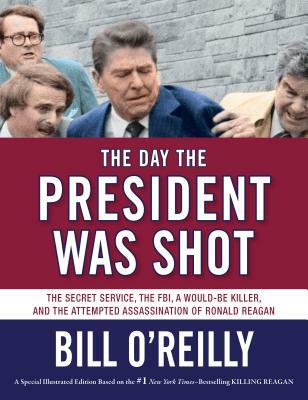 From the scene of the shooting and the dramatic action of the Secret Service, to the FBI's interrogation of the shooter, the life-saving measures of the medical professionals and the president's extraordinary recovery, this is a page-turning account of an attempted assassination and its aftermath.